I often have to write legal documents for recording at the local register of deeds. That means that the first page of the document must have a 2.5 inch heading. Every subsequent page should be set at normal 1 inch margins. In MS Word, I accomplished this by inserting a "section break" after the title of my document, then placing the curser in the new section, and resizing the top margin at 1 inch. Then, as I was typing, the text on a new page would be set at 1 inch all around. So far, I have not figured out how to do this in LibreOffice Write. I have discovered "sections", but when I attempt to create a new section, the margins from the first page continue on subsequent pages. I have also discovered the "manual page break". This is somewhat better in that I am able to make a clean page break with the new page set at the regular margins. But it seems that I have to insert a "Manual page break" for every new page, or the 2.5 inch margin from the first page shows up. So the question is, how can I set a 2.5 inch top margin on the first page and then have all subsequent pages automatically set at 1 inch margins? In Writer, hit F11 to bring up the Style toolbar/dock. Click the "Page Styles" icon (4th from left). Right-click the "First Page" style, then select "Modify...". 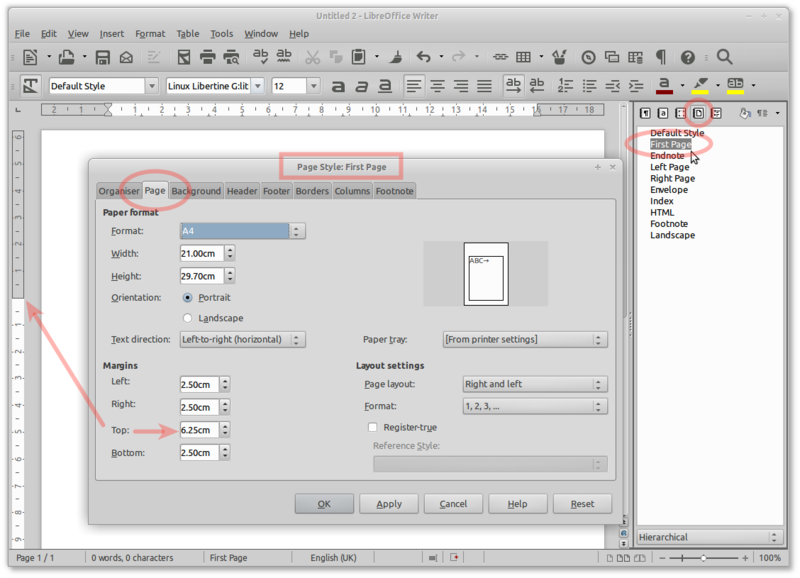 Select the "Page" tab, and set top margin to 2.5" (= ~6.25cm). In your document, with the cursor on the first page, double-click the "First Page" style from the "Dock". If you then do CTRL-ENTER to put in a hard page break, you will see on page 2 that the "highlight" style will revert to "Default Style", and your normal 1" top margin. For a nice introduction to page styles, see this blog post, and for yet more, grab Chapter 7 of the Writer manual (or direct link to PDF) which explains in more detail.